May 22, 2014 February 10, 2016 ~ Sara W.
Over the past few months, I have felt at odds with myself and my role as a mom. I’ve felt inadequate to say the very least. I realized that it was particularly bad recently when I ended each day feeling heartbroken over my behavior for that given day. As it came time to say my bedtime prayers, I found myself asking for forgiveness for countless moments of impatience and ingratitude that had occurred in the course of my day. Then it seemed the very next day would be filled again with my poor attitude, which would result in moments of unnecessary frustration with my kids. I was beginning to panic a little bit, as I felt their childhood slipping through my fingers and visualized their memories being only that of an impatient mom. I began to feel guilty for not embracing this precious time more fully and joyfully. Of course, then they would drive me crazy by doing any number of the things that kids do and I would lose my cool again. It is a sick cycle, is it not? I’ve read so many articles and posts about how I need to cherish this time in their lives and then I get in a tizzy over not spending every waking moment glorying in their every move. Then I’ll read an article about how it’s okay to have shortcomings as a parent and take time for myself and so on. I feel like there is this pressure put on me to feel certain things before the moment has passed. But it’s almost as though the pressure of being happy in every moment is taking away from the moment in and of itself. I think what I’m trying to say is, the role of parent has required the most stretching and testing of my character than any other role I have had or performed. In this sense, my children have been my teachers, as they are surely the ones passing out the tests to me. Therefore, if I am to learn and grow from them, then shouldn’t I have moments of pain and frustration with them? Isn’t it okay for me to not shout for joy every time they enter the room? There is a reason we have the term “growing pains” for when our bones and muscles begin to stretch in a way that is beyond our comfort level. Looking at my role in our family in this new light gives me greater peace for those moments where I honestly just don’t want to be touched or hung on, nor do I want to decide what’s for the next meal while I’m still preparing the current meal, nor do I want to fight with my kids over their need to pick up their toys. I just don’t want to do those parts and that’s okay. Nobody wants growing pains either, but we endure those parts for the glorious moment when we come through taller and stronger. I’m willing to do all the hard parts, I just don’t feel like I should have to sing from the mountain tops over those moments either to have truly cherished their childhood. 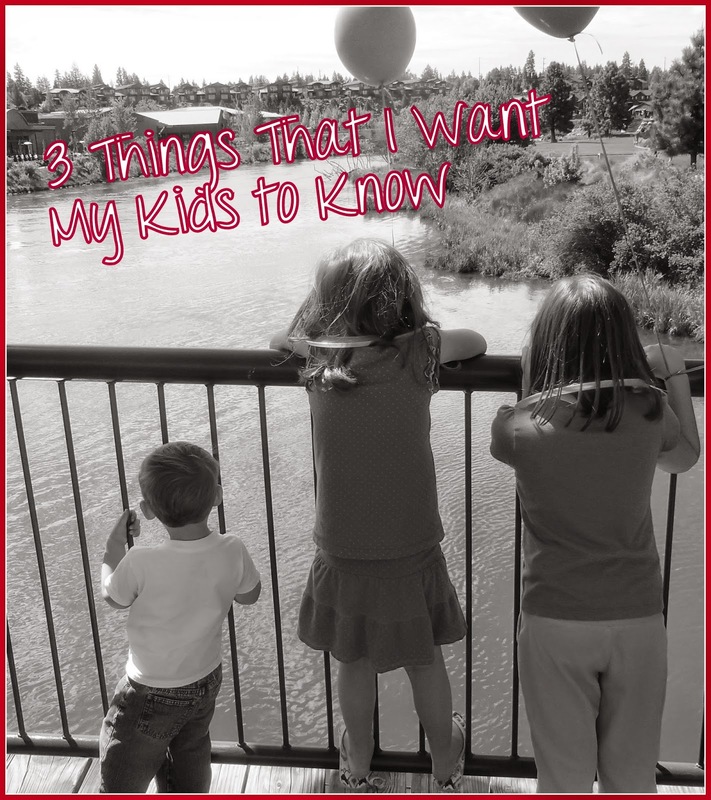 That all being said, and boy was that more than I had planned for my intro, I wanted to write an open letter to my kids to share with them (and all of you) the three things that I want my kids to know. I feel like my knowledge of these three truths, along with my growing understanding of my role as a parent, and their joint knowledge of these truths will help us all be a stronger family unit. I’ve given it some thought and I feel like if you know these three truths, then most everything else that you need to know for a healthy successful life will follow suit. First, I want you to know that you are a child of a loving Heavenly Father who wants what is best for you so that you may return to His presence. So many good and wonderful principles fall in line if you ponder this truth. The greatest thing you stand to learn though by having this knowledge is that you are of great worth. I spent so many years not understanding my worth. In fact, I still struggle to comprehend what it means to be a daughter of God. I get caught up in the world sometimes and think that somehow I am less of a person because I am not more like someone else who has succeeded in a particular fashion. Don’t get caught up in the world, my sweet children, get caught up in the scriptures, in prayer and the goodness of your Savior, Jesus Christ, and your Heavenly Father. Second, I, your Mommy, make lots and lots of mistakes. Sometimes I may express to you that I am disappointed in your behavior, but I am often disappointed in my own behavior as well. It may seem that I’m really hard on you. In fact, sometimes, I may be too hard on you based on the situation. It’s because your Mommy is not perfect. None of us are. Parents aren’t always good about pointing out their own faults or admitting when they’re wrong. It’s a pride thing that you’ll understand more about when you’re older. But I want you to know that I goof up, daily. Sometimes I wish I could just be the perfect Mom for you guys, but I think maybe it’s our imperfections that makes us all so good for one another. That’s how we grow and learn to become better. Be patient with me, as you have so far, your Mommy makes mistakes. Lastly, you are loved beyond comprehension by your Mommy and Daddy. I know Daddy feels the same amount of immeasurable love that I do for you all, but I’ll speak for myself here. I love you more than I can put in to words. Each of you are a gift that I cannot fully believe that I am worthy of having in my life. I’m trying to do a better job at showing my love for you. As a result, I’ve been trying to put my phone down more and watch your simple interactions with the world around you, I’m trying to pray more for patience so that I can have less of those regretful moments where I lose my cool, I’m trying to make sure we read scriptures more so that I can reiterate that first truth that I want you to know, I do all these things because I love you and I want you to know of that love and never doubt it. Now, I should warn you, knowing these three things will not make life perfect and easy. That’s actually why I wanted you to know the second item about Mommy making mistakes. Mistakes and mishaps happen, but because you are a child of God and your Daddy and I will do all that we can to raise you in a loving home, then you’ll have the tools to move forward and hopefully create your own family that will bring you as much joy as each of you brings to your Dad and I. My heart is so full of gratitude for each of you. I am sorry for all of the times that I have acted out of frustration and I appreciate all the times you have forgiven me. You three are such great teachers and I’m sure your little brother or sister who is on the way will be no different. I cherish and love you all so very much!